I enjoyed the other June Thomson books much better -- start with one of those. The best story here is The Case of the Watchful Waiter, which bring into play story elements that I have never seen in a Sherlock patiche. A good attempt at recreating the Sherlock Magic.The start was a tad bit wearying but by the second case the old Sherlock gathered steam. As lwaus In my reading June? Thomson writers almost as a modern Doyl. I have read the!m as they are published and enjoyed them all. After the high of the previous collection of pastiches by June Thomson, this one was distinctly unsatisfactory, on the following counts:1. The plots had neither mystery, nor intrigue, and appeared to be watered down versions of some of the more memorable stories read elsewhere.2. Holmes was too joyous, too smiling, too accommodating, and simply too positive, and hence didn't appear true to the persona created by ACD.3. The stories were unnecessarily full of the 'lingo' spoken by the Victorian underworld, and came as a 'patter' trying to distract us from the fact that there was not a single mystery in the whole book.Disappointing, and definitely not recommended. A decent read but not a brilliant one.The reasons I have given just a 3 star rTing may seem trivial. But they are...1 Lestrade's accent annoyed me. I don't recall him ever being such a stereotypical cockney in the past. I may be wrong and I will admit it if I am but I cannot recall him ever calling Holmes "Mr 'Olmes. 2- far too many French phrases I couldn't understand.3- Holmes seemed far too cheerful and playful.4- I fail to see why any of these cases would have been locked away rather than published? I will read more by this author in the future as I have done in the past. I just hope the next book is better. 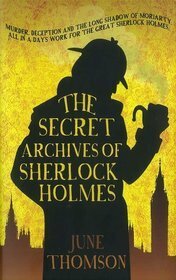 Another good pastiche of Sherlock Holmes by June Thomson... takes one to almost the level of excitement and thrill as the canonical works by Doyle...Of particular note are the Conk-Singleton Forgery case, the case of the One-Eyed Colonel and the case of the Missing Belle-Fille...A good read for fans of Holmes and Watson. Yet another example of an American author writing in a British setting and NOT getting themselves a British editor to handle the Americanisms. This might seem trivial to others, but it's damned distracting to me! Generally uninteresting stories supposedly in the similar style to the original stories. Lacking imagination, straightforward detective stories. Best to avoid. Obviously not Conan Doyle - far too much "lingo" and info that is historically known but that he didn't know. But very enjoyable nonetheless. She gets really close to the real thing. Could do without the footnotes explaining the background to certain comments. June Thomson - June Thomson, a former teacher, has published 24 crime novels, 18 of which feature Detective Chief Inspector Jack Finch and his sergeant, Tom Boyce. She has also written six short story collections of Sherlock Holmes pastiches. Her books have been translated into many languages. She lives in St Albans in Hertfordshire.